As a freshly graduated Communications major from University of Hawaii at Manoa, now is the time to compile all the knowledge I have gained over the past years of schooling and apply it to a relevant career. If ONLY it was that simple. In school, we are taught after a long grueling four, sometimes 6+ years of schooling we will be blessed with our dream jobs. Unfortunately, our economy took a fall and left fellow graduates/employees with pockets full of questions. How will I pay my bills? Will I find a job? Do I need to make an Ebay account? I wrote a broke up letter to my dream job a few years ago after realizing it may never come true. Depressing I know. BUT it was a wake up call. Degrees don’t get salaries. At least not right away. I may not get my dream job, however; I still have hope that I will find a job in which I am stoked to go to and I am ultimately happy. That’s not too much to ask right? 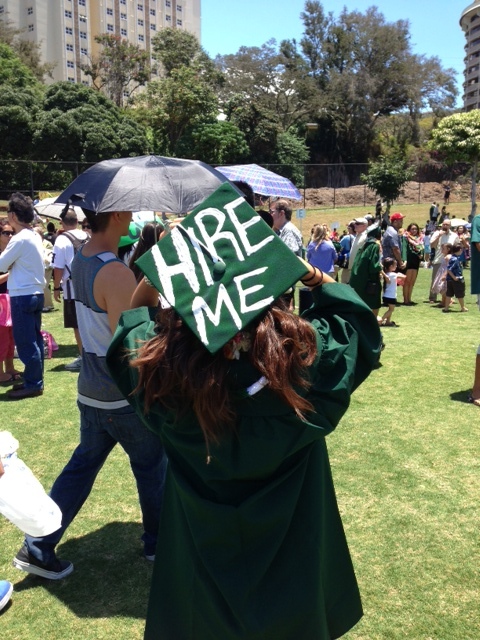 May 11, 2013 I graduated and had been applying for jobs months before I even graduated. With a couple retail jobs, five internships under my belt and a couple of freelance opportunities to note, there is yet a company to accept my countless hours of dedicated free labor which is condensed into a single page PDF file that is called my resume. Despite the lack of responses to each hopeful email sent to companies I continue to apply to as many jobs that I could potentially see myself at as well as immersing myself in the grateful opportunities that are presented to me. AND that, my friends, is why I am starting this blog. No matter how many times the door of opportunity gets slammed in my face I will never give up. Follow me on this uncensored journey to finding the secrets of obtaining a job in the “real world” cause rejection: ain’t nobody got time for that! Look forward to reading more! I’m in a similar position and I’ve found myself asking those same questions from time to time as well. Thanks Michael for reading! It’s always humbling to know others are in a similar position.